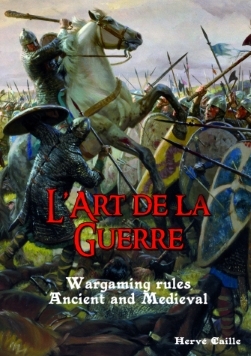 So I thought I would try them with L'art de la Guerre (ADG), which has rules for morale (the Swiss are elite! ), and special rules for halberds (they are not the generic blades of DBA3). I have already played some games of ADG, and think it is good at the 100 point level. This is around the 12 element mark, and gives a fast game finishing in less than an hour. Anyway, I played against Martin. 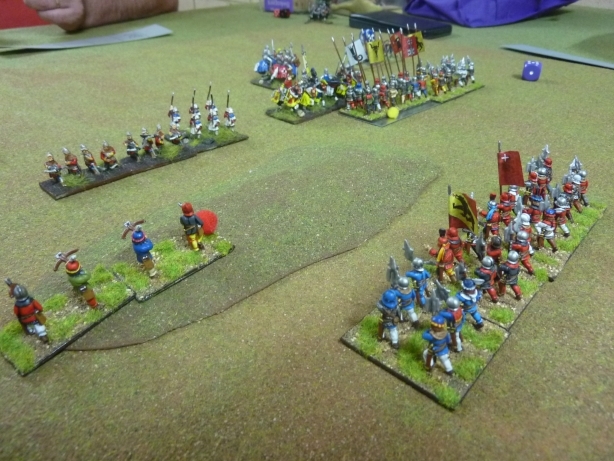 The Swiss (list 220) were: 6 Halberdiers (Medium swordsmen 2HW Elite), 2 Pikemen (Pikemen Elite), 2 Crossbowmen (Light Infantry Crossbow), a brilliant general and fortified camp for a total of 11 elements and 100 points. Martins Germans (list 227) were 4 Men-at-Arms (Heavy knight impact), 1 Mounted Crossbow (Medium cavalry crossbow), 2 Militia (Crossbowmen), 2 Free Canton Militia (Medium spearmen), 1 Halberdier (Heavy swordsman 2HW), 1 mediocre bowman, and a brilliant general integrated into a knight unit. 11 elements and 100 points. This was the starting situation in the first game. Needless to say that we are novices with the rules and made plenty of mistakes. Martin experimented and charged his knights into the pike. In DBA3, the pike crumbled under similar circumstances, but in ADG they are more resilient. 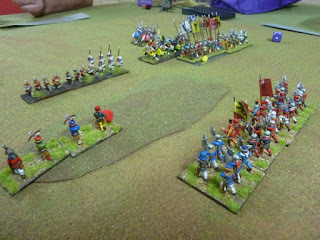 By the end of the game, 2 knight units ended up being destroyed in these frontal charges. This alone made the Swiss a lot tougher. At some point, both lines were fully engaged. By the end, the Swiss left flank ended up collapsing, while the German centre gave way to the pike push. True to form, the German knights with general also destroyed a halberdier unit - some things never change. As mentioned, we made plenty of mistakes with the rules and the first game really ended in a draw. We then tried a second game. 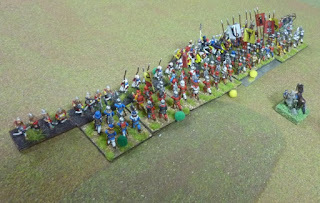 This time the German knights dismounted to take on the pike on foot. So the pikes did not wreak the havoc of the first game. This time, the "elite" quality of the Swiss came a bit more to the fore, which helped the halberdiers do a lot of the damage instead. The German medium spear and bowmen did not do too well. Both games lasted about an hour each. The rules are probably a lot more complex than I thought, and there was a lot of looking up the book during the games. Also, in ADG, once lines are joined, there isn't much manoeuvre but lots of dice rolling until one side wins. When this is the case, I am not sure that a "brilliant" commander is important anymore, or what players can do apart from rallying troops in combat. I do like the extra flavour - the effects of armour and morale can have a dramatic effect during the battle. There were a few times where a loss was turned into a draw, or a draw turned into a win with morale. And there is a distinct difference between the ancient and medieval periods. On the rules website artdelaguerre.fr, there is mention of fantasy lists coming out at some point, that would be interesting to see.